Dark. Intense. Hot. ad infinitum: endlessly, forever, without limitThe Primani Series continues with Sean and Aisling! 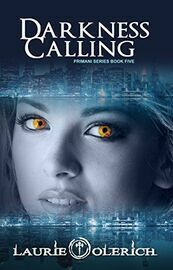 Darkness Calling is a stand-alone title.Finally freed from a century in purgatory, Aisling just wants to raise her son and live as a normal human again--Her demon hunting days are over. But her taste of freedom is cut short when her past catches up with her. Cain is the one demon she couldn’t kill. One she couldn’t resist, didn’t resist. Now he’s back to keep her on a short leash. When he threatens to take her son, she turns to the one man who can save them both. Sean.Sean is sick and tired of his baby mama’s mood swings, and he’s seriously thinking of strangling her. But when a brutal old enemy shows up to destroy everyone Sean loves, he discovers Aisling is hiding more than her feelings for him. Joining forces to protect their son, Sean and Aisling set out on a journey that leads them from the city streets of Manhattan to the elegant hotels of Vienna to the final terrifying showdown in the bowels of Rome.Books in the Primani Series:Primani (The Lost Soul Trilogy #1)Call the Lightning (The Lost Soul Trilogy #2)Stone Angels (The Lost Soul Trilogy #3)Broken Souls (Primani Series Stand Alone)Darkness Calling (Primani Series Stand Alone)˃˃˃ About the Series...Primani are soldiers with supernatural abilities granted by an archangel. They police demon activity that threatens humankind. Before becoming Primani, all were superior warriors (Celts, Huns, Vikings, etc.) with unique psychic abilities. The series follows them as they cross lines, fall in love, and butcher demons to save the world. Living by a loose code of morals, they’re more mercenaries than angels, prone to violence, vengeance, and in the end, sometimes, heartbreakingly pure love. The first three books follow Mica’s transformation from human to immortal after she becomes entangled in the Primani world. Each subsequent book focuses on the unique story of each Primani as they battle both Hell and their own inner demons. Often dark, funny, full of twists, and steamy passion, the Primani series crosses the lines of paranormal romance, metaphysical fantasy, and occult suspense.˃˃˃ Everyone has an ex they regret. What if yours was a demon with the power to take you anytime, anyplace? Would you run? Fight? Lie down and let him?Scroll up and grab a copy today.